Growing up as a boy from the Parayar caste, in the milieu of Christian, Hindu and Muslim communities, K.A. Gunasekaran narrates the familiar tale of caste oppression and prejudice prevalent in the villages of Tamil Nadu. 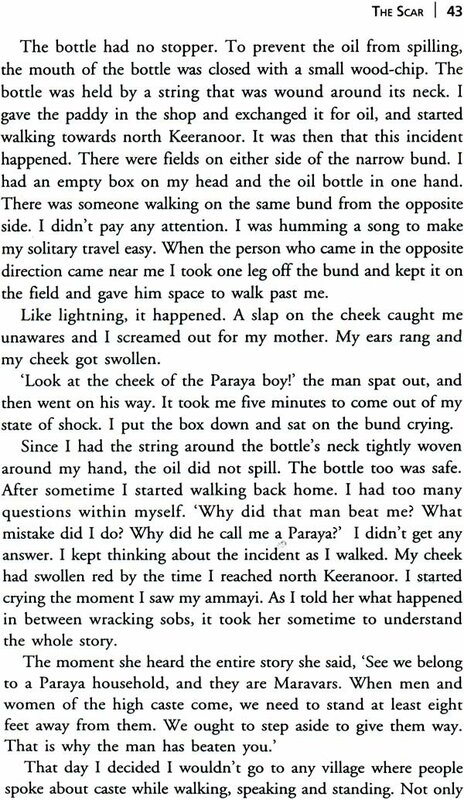 As the narrative unfolds, the reader is shown how the ‘low’ caste negotiates differently with the three religious communities. The deep pain of the Paraya surfaces through the risible anecdotes that ridicule the grievously unjust practices of the ‘upper’ castes. The book emphasises the fact that Indian villages are doubly caste-conscious and cruel, and that Dalit emancipation rests in better education for the community. 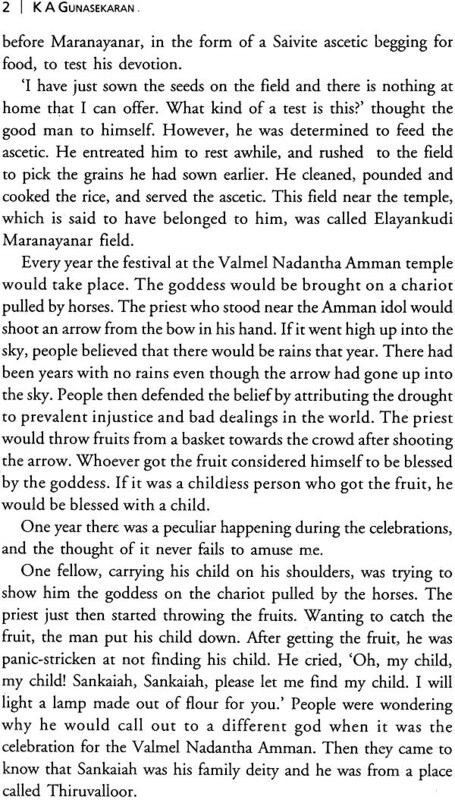 Gunasekaran writes in an earthy and colloquial style to capture the innocence, cruelty and drama of a South Indian village. Considered the first modern Dalit autobiography in Tamil, The Scar is an important book calling for Dalit assertion and emancipation. K.A. Gunasekaran is a teacher, folk-artist, dramatist and researcher. He was the dean of the School of Performing Arts at Pondicherry University. Currently he is the director of the International Institute of Tamil Studies. V. Kadambari teaches English at the Ethiraj College for Women, Chennai. She is a bilingual writer and translator, and is keenly interested in gender issues and gender studies. My early days were closely associated with the people of Islam. 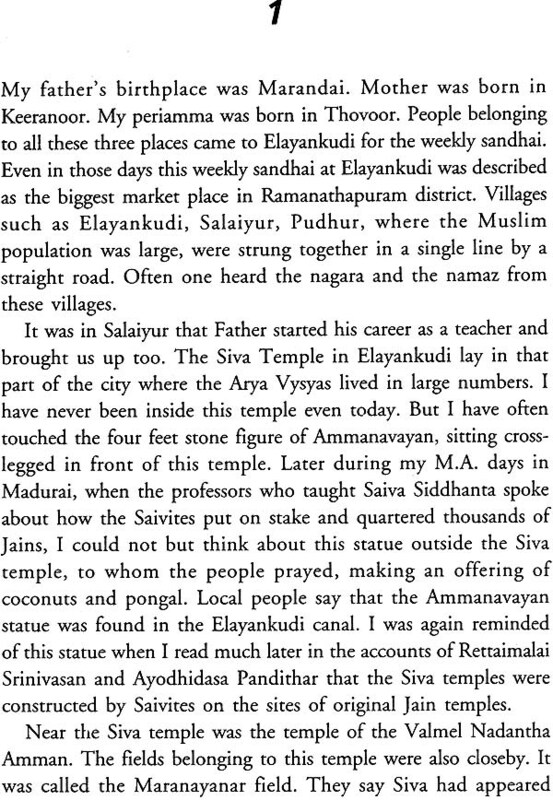 I realised even while at school, that caste differences did not exist in Elanyankudi - a place with a large Muslim population, whereas in places just two kilometres away, it was found in excess. I contemplated the horrid experiences I have had because of caste discrimination in my early life. Vadu evolved. Anger welled up as I wrote about the discriminatory practices that I had suffered; sometimes tears flowed. I have captured in my writing all the experiences that I narrated to my friends on various occasions. Kalaikulam village is near Thayamangalam. This is where my friend Samidoss was born. I had an unforgettable experience when I stayed there one night. At around midnight, a kudukuduppaikaran entered the cheri making the eerie rattling sound peculiar to his tribe. I woke up even as he entered the street. I told Samidoss, ‘Dei! I will hide in the cattle shed opposite your house. I want to see how this fellow makes his appearance.’ Samidoss warned me saying, ‘He will bring the ghosts with him. He will incapacitate you.’ I decided to confront him and hid myself in the cattle shed. Samidoss lay frozen with fear. In Salaiyur, during Ramzan, the fakirs would go around the Muslim streets, singing to the accompaniment of beats kept by a small drum. I used to stay awake to watch them. I think it is this habit that helped me to accost the kudukuduppaikaran in Kalaikulam. Like this, there are so many anecdotes which come to my mind on and off. There are many incidents, which have been left out. I have written about only a few of them in Vadu. When I read parts of what I had written to Elango teacher, he felt as though it was his own experiences that were being narrated. Comrade A. Marx encouraged me to compile my experiences. Comrade Ravikumar published an excerpt from Vadu in Dalit Murasu magazine. It was well received. In order to bring it out as a book I sent a soft copy of Vadu to Kalachuvadu. I had the unique privilege of having Professor Nanjundan as the editor of my book. He gave me useful suggestions to bridge the gap between my style and the content. Our meeting at Salem and the discussions I had with him helped in making Vadu understandable to all readers, without compromising the language of my soil. His knowledge of grammatical Tamil without any formal training in it is Impressive. I have related my experiences upto my college days in this account. The experiences I have had since the time, my involvement in Marxist movements, my journey down the arts lane, do not figure in this book. Dalit youngsters who read Vadu may be inspired to realise that they need to fight this caste-ridden society with more energy than the others do. For the others, this book is an introduction to dalit life. While proof reading, my wife Revathi’s constructive criticism of my style of writing was very useful. To her and to Comrade A. Marx, I owe my gratitude. I am grateful to my friend, Nanjundan, Comrade P. Panchangam, Dr. A. Thirunagalingarn, a friend from my childhood days (who reminded me of the many experiences that I had left out) and Karasur Palanichami. I also thank Ravikumar for his erudite preface, and Kalachuvadu Publishers. History, a string of incidents woven together like beads in a rosary, does not leave any trace of the Dalit people. Hence they write their history themselves. Autobiography is the consequence of their yearning to create their society’s history through their individual life story. Dalit autobiography has turned out to be not only a part of the Dalit history but also an important node of Dalit literature. Not only are they published in various Indian languages, but are also translated into English. Autobiographies of Narendra Jadhav, Sharankumar Limbale, Vasanth Moone, Omprakash Valmiki, Laxman Mane and - others have been translated into English and other European languages. The autobiographies of Aravind Malagatti and Siddhalingayya, written in Kannada, are at present translated into English. These translations have created a special place for Dalit literature at the global level. We do see difference of opinion among the critics about their response to Dalit literature. Some feel it is gaining visibility at the global level while others contemptuously look at it as a strategy of liberalisation to convert the Dalit sorrows into assets. 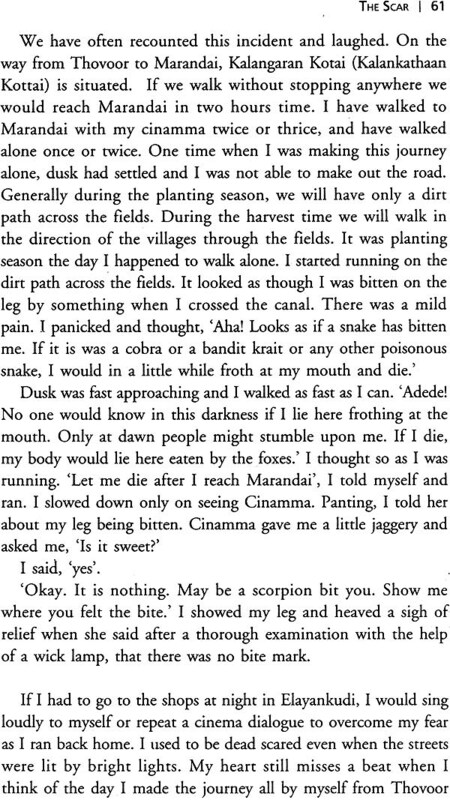 (Touchable Tales, 2003) Nevertheless, autobiography as a literary form has been used all over the world by the oppressed as a vehicle to project themselves. Despite the campaign about the death of the author by the Post-Structuralists, autobiographies continue to be written. At the national level, Ambedkar and Rettaimalai Srinivasan are the precursors of the Dalit autobiographical form as per research indicators at present. Their autobiographies have in fact come out as precise notes. Both autobiographies seem to have been written in1939. In fact the last note in Arnbedkar’s autobiography gives a detailed account of an incident that happened in 1938, thereby proving that the compilations must have been brought out after that. Rettaimalai Srinivasan’s Jeeviya Saritira Surukkam (A Brief Autobiography) was published by Pyne & co, Madras, in 1939. According to Ambedkar, foreigners do know that the stigma called untouchablility is in vogue in India. But they do not know how gruesome it is. Ambedkar further observed, a dalit in a village does not socialise with others nor is he accepted by others. Despite this he considers the village to be his. Foreigners are puzzled by this. Therefore, the challenge is to give them the exact picture of how the untouchables are treated by the caste Hindus. According to him this dichotomy could be solved in two ways. One, by giving a general description of how the untouchables are treated, or two, by describing it with the help of the various happenings in one’s life. Knowing that the second way would be more effective, Ambedkar described untouchability with the help of select incidents from his own experiences and from that of others. These reminiscences written to form parts of Ambedkar’s autobiography have been compiled under the title Waiting for a Visa. Six incidenrs that happened between the years 1901-38 are presented in this compilation. It is more or less at the same time that the autobiography, Jeeviya Saritira Surukkam by Rettaimalai Srinivasan, was published. It is this book, which could be considered for the present as the precursor of the Tamil Dalit autobiographies. We cannot classify all the autobiographies that are written by the Dalits all over India as akin to Ambedkar’s or Rettaimalai Srinivasan’s writings. However, in all the Dalit autobiographies certain elements that are found in the above two pioneering works can be seen. In the Dalit autobiographies one can see the inhuman aspects of untouchability. Hence it can be said that Dalit autobiographies help to promote an ideology against untouchability. Only the views of Pandit Ayodhidasar have been republished from the magazine Tamizhan. We do not know if the magazine had creative literary writings. Anbu Ponnoviyam says that some information can be culled from Madurai Prabandam and Rangoon Prauesa Thirattu published in 1896. According to Ayodhidasar’s writings, Valluvar and Avvai are the ancestors of the Dalits. If their literary works, which flails against caste divisions, can be considered as part of Dalit literature, one may be able to understand the heritage of Dalit literature as being equal to the agelessness of Tamil itself. Many essays of Ayodhidasar could be shown as illustrations for the critical views on Dalit literature. (I am also writing a book on it). It can thus be said without hesitation, that only in Tamil have efforts been taken for a critical analysis of Dalit literature. While speaking about Marathi Dalit autobiographies, Arjun Dangle terms the period 1978-86 as the autobiographical literary period. Daya Pawar’s Baluta, M.K. Sen Kamble’s Advanin Che Pakshi, Laxman Mane’s Upaara are mentioned by him. After this period many more autobiographies have been published in this language. K.A. Gunasekaran’s Vadu makes its appearance against this background. It talks about his life up to his graduation. Not only is it a record of his experiences, but it is also a documentation of a certain time. When talking about his father, a school teacher, struggling to give him an education; or his mother who had studied upto the middle school even in those days, but nevertheless had to take up jobs like issuing tickets at the cinema theatre, chopping firewood and cutting grass to support the family; or about how he and his siblings contained hunger by eating soaked tamarind seeds for breakfast, Gunasekaran’s language touches-the depths of one’s heart without in the least evoking pity. 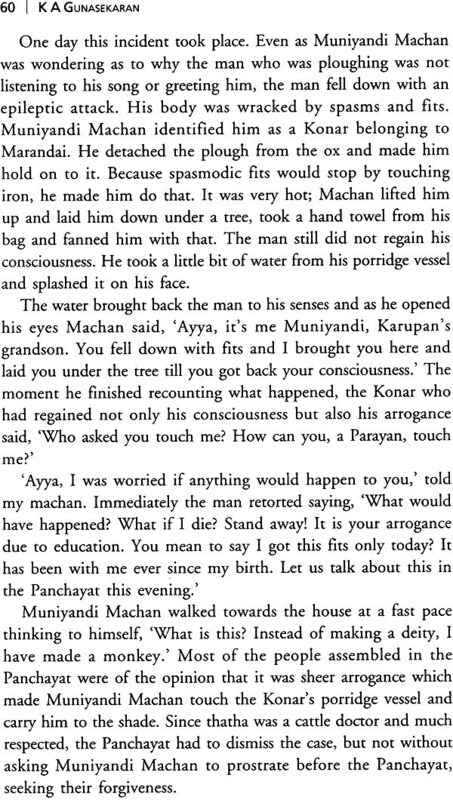 We do not see in Gunasekaran’s language the anger of the language of Namdeo Dhasal, who wished ‘to copulate with hunger’. Nevertheless, his language instills that anger in the reader.